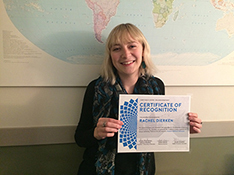 Rachel Dierken, who became the Education Abroad Coordinator in November 2017, has been named a Student Wellness Advocate by the Curry Health Center. This recognition is given to a UM employee who is nominated by a student for promoting student success. Dierken supports students who are interested in studying abroad by listening to their academic and personal goals and recommending study abroad programs based on those goals. She outlines the entire application, pre-departure, study abroad, and re-entry processes to ensure that students are as well-informed as possible when studying abroad. This encourages students to make the most of their experiences and to reach out to her and other available resources. The Global Engagement Office is happy to have Rachel build upon the work of previous Education Abroad Coordinators and to help students reach their academic and personal goals through international life-changing experiences. To contact Rachel about education abroad opportunities, please send an email to rachel.dierken@umontana.edu.